Jimmy Barnes’ hugely successful and popular Soul Series, the legendary rocker’s journey and exploration of his musical roots, will come to a natural conclusion with the release of its fourth and final installment Soul Searchin’ on 3 June 2016. The all-new album follows Soul Deep (1991), Soul Deeper (2000) and The Rhythm and the Blues (2009) which have earned more than 12x ARIA Platinum Sales Awards between them. Complementing the Soul Searchin’ album release will be an hour-long documentary, premiering that first weekend of June on the 9 Network nationally. The special follows Jimmy as he travels to America’s south in search of lost soul gems, searching for the musicians who made them, the places that inspired them and equally reconnecting with his own musical soul at the same time. Soul Searchin’ is the result of this both literal and metaphorical journey. Jimmy and his soul ensemble will be hitting the road throughout August to celebrate this milestone release, playing all the hits from his 25 year artistic pilgrimage and the songs that inspired him to become a singer in the first place. The tour will treat six cities across Australia to one show only, a treat for those lucky enough to secure tickets. Notably, Jimmy will be returning to Melbourne’s Palais Theatre where he also performed back in 1991 in celebration of Soul Deep. The Soul Searchin’ Tour will be 100% classic soul performed by Australia’s most celebrated singer, featuring all the hits from Jimmy’s four best-selling Soul Series albums across two stellar sets. Like its predecessors, Soul Searchin’ is a snapshot in time. The album was recorded in Nashville at one of the traditional homes of soul, the legendary Grand Victor Studio, which was built at the request of legendary musician and producer Chet Atkins back in 1965. The studio’s client list, past and present, reads as a ‘who’s who’ of music legends. Jimmy was joined in the studio by some of the greatest soul musicians ever assembled, including Steve Cropper (Booker T. & the M.G.’s, Otis Redding, Sam & Dave, and later gaining fame as a member of the Blues Brothers band), Dan Penn (musician, songwriter, and record producer who co-wrote many soul hits of the 1960s) and, of course, The Memphis Boys who date back to original recording sessions from the mid ‘60s to the early ‘70s with Aretha Franklin, Wilson Pickett and Joe Tex, amongst many, many others. 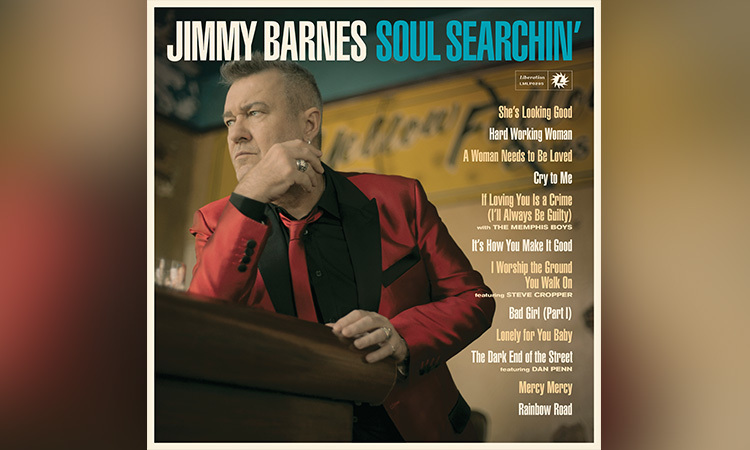 Soul Searchin’ is full to the brim with some hidden gems and some certified soul classics, all given the inimitable and unmistakable Jimmy Barnes treatment. The soaring guitar riffs, bedazzling horn arrangements and old-school backing vocals that give the album its alluring, old-fashioned charm will come alive on stage – don’t miss the Soul Searchin’ Tour as it makes its way across Australia this August. Congratulations Jimmy ,loved watching the Doco today, and the respect that you showed to all the older Musicians.